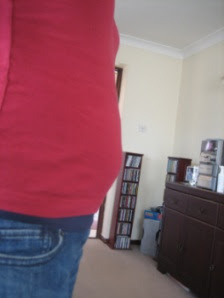 Couple of picks of bump! 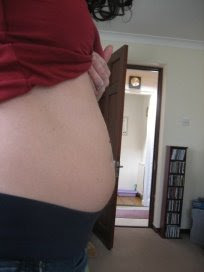 I went to the midwife today so just thought I would write a quick update. I did get to hear the heartbeat. It was really strong and healthy sounding. Was surprised at how clear it was - I expected it to sound faint or, well different. Was a shame Stuart wasn't there to hear it. Blood pressure was quite high but I was kinda expecting that - I've had to have tests on my blood pressure and heart before so I'm sure it is fine. I do have to go back in a couple of weeks though to check it is ok.
No real solution to headaches other than my plan to go and get a massage, reflexology or some other 'alternative' therapy solution. Doesn't stop the man with a hammer crashing down the walls in my head at the moment though.